Packaging Aids Corp. 552 High Production Band Sealers seal most of the modern packaging materials such as PE, PP, PVC, Polycello, Laminated and Mil Spec. All models come standard with a digital temperature controller that gives accurate control to a maximum temperature of 550° F (288° C). The jaw pressure is adjustable to differing material widths. Seal widths are 7/16” standard or 1/8”, 5/16” and 13/16” are optional. The Packaging Aids Corp. Model 552 Horizontal Band Sealer comes standard with an integral conveyor-- the conveyor and sealing belts stay in sync. The 552 is adjustable. The conveyor and sealing head can be tilted to any position up to 30 degrees, and can be raised or lowered between 28” and 36” above the floor. 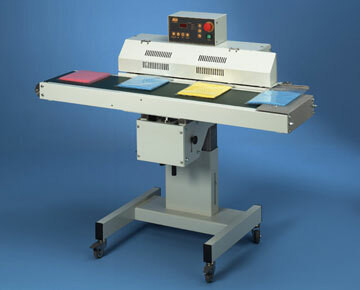 The conveyor can also be lowered to 1-3/4” below the sealing belts for sealing of bulky packages. The conveyor dimensions are 12” wide and 46” long.